NWN Media, which publishes titles including the Evening Leader and the Chester Standard, has become the latest regional media group to partner with property search engine Nestoria for its property listings. Prior to signing up the Johnston Press division, the start-up has made deals with fellow regional newspaper group Archant and the Independent. 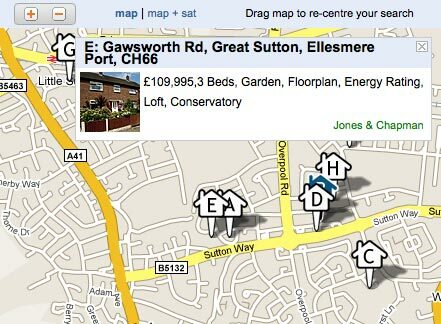 It’s also partnered with listings sites Zoopla and PropertyNews.com. This entry was posted in Advertising, Newspapers, Search and tagged Archant, classifieds, Evening Leader, fellow regional newspaper, Johnston Press, media, Nestoria, NWN Media, property search, property search engine, search engine on August 14, 2009 by Laura Oliver. Archant’s EDP24 site has released a new local business directory complete with search results plotted on a Google map, which can be refined by distance. The directory builds on Archant’s existing jobs and property sites, Jobs24 and Homes24, which use geotagging technology to map the listings. Built into the directory are a range of packages for advertisers looking to have a listing on the site. In a similar vein, Telegraph.co.uk announced a partnership with vertical search engine Nestoria last week to ramp up its property listings. This entry was posted in Multimedia, Newspapers and tagged Archant, EDP24, google, Nestoria, property search, search engine, search results, Telegraph.co.uk on November 24, 2008 by Laura Oliver.